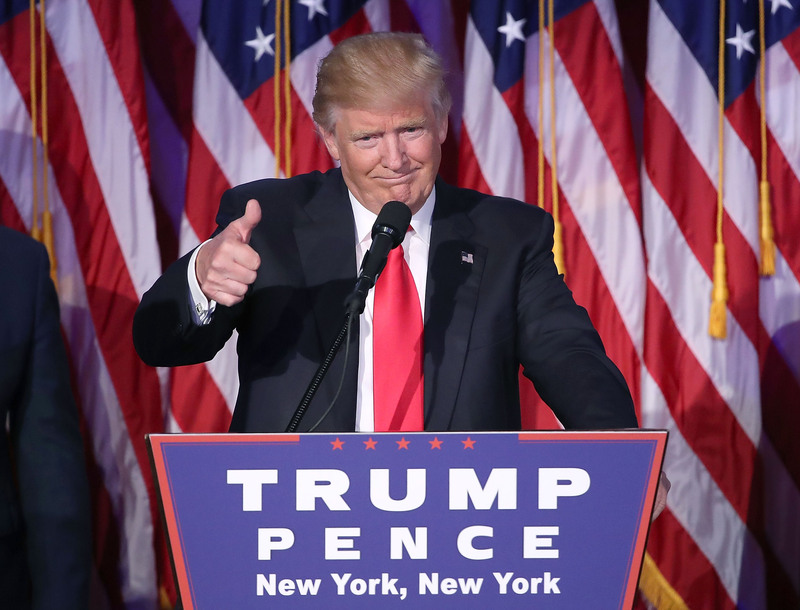 In one of the most unexpected and most polarizing upsets in modern history, Donald Trump became the president-elect on Tuesday. He secured an estimated 279 electoral votes, according to The New York Times, but he ultimately lost the popular vote to Hillary Clinton. That means more there are probably more people unhappy about the results than happy — and those unhappy voters now have to figure out how to accept Trump as president, even though they didn't vote for him. Many Americans seemed to resist the idea of accepting Trump altogether. On Wednesday, demonstrations took place across the country to oppose Trump's victory, with protestors using a "Not my president" message. Ultimately, though, that's not the most productive approach. As difficult as it seems, it's time for voters to accept Trump's victory and begin to take action within the political landscape that he creates for the country. Like it or not, Trump is soon to be our president — and if some of his most powerful critics can get accept that, then so can we. Take Trump's predecessor, for instance. President Obama reportedly spoke with Trump on the phone in the early morning hours of Wednesday. When Obama addressed the public on Wednesday afternoon, his message was congratulatory and forward-thinking. Everybody is sad when their side loses an election, but we have to remember that we are all on the same team. This is an intramural scrimmage. We're Americans first. We're patriots first. If Obama, who once called Trump "unfit to serve as president," can turn around post-election and tell the country that he's on the same team as Trump, then we can put an end to the chaos that is occurring as a result of Tuesday's divisive results. Not to mention, Trump's biggest Democratic rival also called on Americans to accept the Republican presidency on Wednesday. In a formal concession speech, Clinton told doubters and skeptics to keep an open mind in the days, weeks, and months ahead. ... I still believe in America and I always will. And if you do, then you must accept this result and then look to the future. Donald Trump is going to be our president. We owe him an open mind and the chance to lead. Following Trump's victory, skeptics from his own party also called for unity. Although he reportedly didn't vote for the president-elect, former President George H. W. Bush tweeted a congratulatory message on Wednesday. His son, former President George W. Bush, wished Trump well through a statement. Sen. John McCain of Arizona, who struggled with Trump's campaign throughout the election season, vowed to "work with" Trump on national security. Throughout his campaign, Trump was no ordinary candidate. He had no political experience, he often made politically incorrect remarks, and his plans for the country were controversial at best. Now, accepting his victory is no ordinary feat. But if there's one thing that unites Americans, it's faith in the democratic process, and that faith shouldn't expire because of one election.